Are you looking to take your Audi to the next step in ultimate performance? ModBargains has your answer with the newly released AEM Methanol Injection Kit. This simple and affordable performance modification will give you the edge over all the competition. AEM's Injection Kit has comparable horsepower and torque gains to that of Nitrous Oxide; with a fraction of the price and guaranteed safe on any vehicle, no matter if it is highly modified or completely stock. Methanol Injection is the new tuner mod for all forced induction gas BMW's because of its safety, versatility, affordability and unheard performance gains. AEM has perfected this kit to work with your engine in unison, allowing to maximize its efficiency and giving you from 20 up to 60 wheel horsepower! This kit is perfect for all the horsepower freaks out there looking to take their Audi to the next step in performance modification, as well as the daily driver looking for an affordable way to blow your competition out of the water. What is the Benefit of Buying a Methanol Injection Kit? AEM's Methanol Kit is the new must have performance mod! It is affordable, easy to use, and very safe. It is designed to create nothing but pure horsepower and torque throughout the entire rpm range. It does this by injecting a steady mist of methanol into your intercooler line, not only cooling the air but also increasing its combustibility; giving your Audi that extra edge over everybody else. This kit was designed with safety in mind with several sensors and cut off switches to put you at ease that nothing will happen to your Audi. Where can I get Methanol? A huge advantage to methanol injection over others like nitrous oxide, are not only is this kit a fraction to the cost of NOS and is completely safe but Methanol is cheap and easy to get. VP Racing Fuels offers several different types of methanol to suite your needs (M1, M3, & M5). VP gives you a range of different kinds and amount to suite your application from 5 gallon to huge 54 gallon drums. Click Here to Learn More About VP Racing Methanol Fuels. How often do I have to fill up the Methanol Tank? AEM's Methanol Kit is very conservative and affordable to maintain. It is recommended to mix your methanol in a 50/50 mix with water. This does not only helps to save money but also helps to cleans the carbon build up from inside your engine. With a 5 gallon drum of methanol it will last up to 3 to 4 months, and with the methanol being very affordable this methanol kit will be easily still the cheapest mod that will give you this kind of horsepower. PLEASE NOTE: In CA AEM's Methanol Injection Kit is NOT legal for street use. This kit was designed only for off-road or track use. AEM Water/Methanol Injection Kits reduce air inlet temperatures which allows users to increase boost pressure (and advance timing on forced induction gas applications) to create more power by utilizing the cooling effects of the system under heavy load. The kit is offered in 2 configurations: a 1-Gallon kit for racecar applications, and a 5- Gallon HD kit for Diesel applications or racecars requiring extended range. Both kits include all the elements necessary to do water/methanol injection right, including a standard fluid level sensor for the tank, recirculation-style pump, feature-loaded controller, and complete hardware for installation on practically any diesel or gas application. 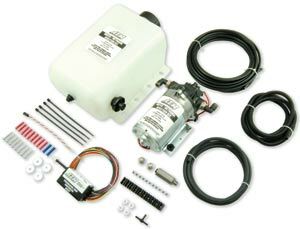 For users who intend to use a custom or existing reservoir, AEM also offers a “tankless” pump and jet kit. There are no hidden costs or additional components required. AEM's recirculation-style pump offers improved performance, reliability and a much smoother, quieter operation when compared to older switched-style pumps. With the use of a new internal bypass design, AEM's upgraded pump eliminates erratic on and off switching/pulsing and ensures consistent fluid delivery for optimum performance. With durability and reliability in mind, AEM has designed the pump with a Santoprene diaphragm and EPDM seals to withstand the harshest of alcohol mixes. 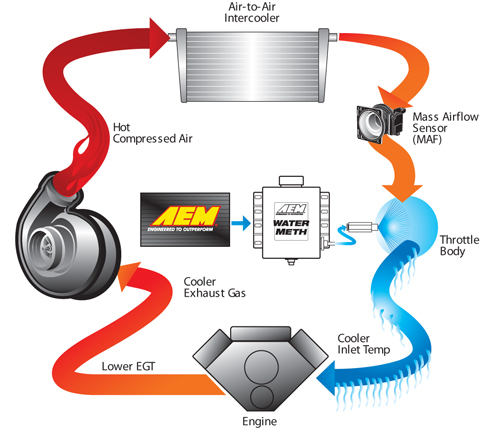 Why Should I Choose AEM's Methanol Kit Over Others? Unlike other comparable Methanol Kits, AEM has spent years in research and development making sure every aspect of this kit was addressed. This Meth Kit is not only designed to work perfectly with any forced induction vehicle, but one if its largest benefits is its versatility. It is much smaller and compact then other kits on the market. The one gallon kit can be mounted on the side of your trunk, only using a small amount of room. It can also be mounted anywhere in your BMW where there is room for a one gallon tank. The kit comes with plenty of hose length to fit any style of application. 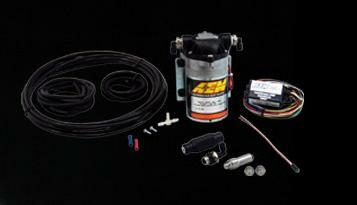 AEM is proud to release its Water / Methanol Injection Kit for high-performance, forced-induction vehicles. The Water / Methanol Injection Kit is universal by design and adapts to virtually any forced induction vehicle via multiple jets to suit your car’s power requirements. What does the 1 gallon Methanol kit include? 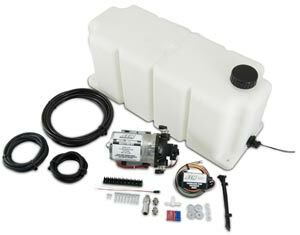 What does the 5 gallon Methanol kit include? What is the Difference in Tank Sizes? AEM's Methanol Injection comes in two different tank sizes, a 1 gallon kit and a 5 gallon kit in order to meet your needs. The 1 gallon kit is perfect for the daily driver or someone who hits the track on the weekends. The 5 gallon kit is more designed for racing applications in which they are on it hard for long periods of time with puts a lot more methanol into your engine. The AEM Water/Methanol Injection Filter is an in-line filter that uses a micronic mesh screen to filter particulates as small as 40 microns. This allows a cleaner flow of water/methanol to be passed into the engine, not only protecting the internals of the engine itself, but also the working parts of the water/methanol pump, too. Run the AEM Water/Methanol Injection Filter in-line before the pump to protect both pump and engine. Simple to install, takes less than a minute. The first and only analog Water/Methanol Flow Gauge on the market today! horsepower and 47 LB FT of torque gain at 16 lbs of boost. NOTE: AEM and ModBargain.com holds no responsibility for any engine damage that results from the misuse of this product! This product is legal in California for racing vehicles only and should never be used on public highways. 20-amp pump driver with over-current, over-voltage and under-voltage protection. Error protection output with over-current, over-voltage and over-temperature protection. Cockpit status LED for errors and low fluid. Pump open and short detection and indication. Works even if the pump is off. “Test” function that includes manual pump triggering. Two dial pump speed control. 8 Screw, Pan Head #8 x 1.0"
4 Screw, Pan Head #6 x 0.5"
4 Washer, #8 x 3/4"
4 Washer, #8 x 7/16"
Find a suitable location to mount the tank and pump. The pump should be mounted so the top of the tank is lower than the final injection location. The pump should be mounted at or below the level of the tank. Use 4 of the 8 supplied #8 sheet metal screws along with the 4 large washers to mount the tank. On the pump, note the directional arrows indicating fluid flow direction. Use the other 4 #8 sheet metal screws along with the 4 small washers to mount the pump. The orientation of the pump is not important, it will work regardless of position. Measure the distance between the fluid outlet on the bottom of the tank and the fluid inlet on the pump. Make sure there are no sharp bends in the hose. Cut the hose to length with a clean perpendicular slice, making sure the ends are clean and flush. Push in the hose at the tank and pump to install. Make sure they are pushed in all the way and check with a light tug on the hose. Secure the hose to the chassis using sections of the supplied hose routing strip or with zip-ties. Find a convenient location for the controller. The adjustment settings should remain in an accessible location but still be protected from possible water incursion. If you need to extend the wires to mount the controller use at least 14 AWG wire for the pump and controller ground circuits and 18 AWG for the remainder. Use the 2 supplied #6 screws to mount the controller. Find a suitable location in the drivers line of sight to mount the status LED. Mount the LED and run the wires to the controller. The LED indicates the operation of the controller. If the pump is off and there are no errors the LED will be off. If there are no errors and the pump is on the LED’s intensity will vary with the pump speed. If there are any errors they will be indicated by flashing the LED. Three jets are supplied with the kit. This ensures that regardless of your desired horsepower you will not need to purchase additional jet sizes. The nozzle will come pre-assembled with the smallest jet. Regardless of your eventual horsepower settings it is recommended that you start with this jet for your initial testing. The nozzles are interchangeable and you can disassemble them for cleaning. If you find excessive debris in the screen check your tank for contamination. When installing the screen it is only necessary to be slightly tighter than finger tight. Do not over-tighten. The nylon washer included is reusable but a spare is included for future servicing. Select the location where the nozzle will be installed. It must be before (upstream of) the throttle plate. If a MAF sensor is present, it must be placed between the MAF sensor and the throttle plate. For the maximum cooling effect mount the nozzle toward the filter or turbo discharge. Either weld on a 1/8” NPT bung or drill and tap a hole for the nozzle mounting. Measure the length for the hose and cut. Before installing the nozzle for the final time proceed to the “Pump/System Check” stage to confirm proper operation. Find a location after the throttle plate to tap into your manifold pressure (boost). DO NOT hook it up to the pressure at the turbocharger or at your boost controller. It must be after (downstream of) the throttle plate. Use the supplied hose and “tee” if needed. Black wire connects to Controller - Orange wire. The “TEST” push button on the controller module can be used to test the system. Press and hold the button to activate the pump. The pump speed will gradually increase from zero to full speed over 6 seconds and then stop. When the button is released the controller will return to normal operation. After all wires are hooked up, add water to the tank and with the nozzle pointed into a container, press and hold the test button. The flow will start gradually and increase to a steady amount. If this happens then your system is connected properly. Check and repair any leaks. Drain the water out of the tank and install the nozzle. Trigger Condition: Current exceeding 15A on the driver output. The status LED will flash a count of three and repeat. The pump driver will turn off to protect itself and automatically retry every second. If the short is removed the controller will function normally. Fluid flow is lost in this condition. Trigger Condition: Open circuit between pump drive and battery voltage. The status LED will flash a count of two and repeat. The pump driver will continue to drive the pump. If the open is repaired the controller will function normally. Fluid flow may be lost in this condition. Trigger Condition: Battery voltage is below 8.5V or above 16V. The status LED will flash a count of four and repeat. The pump driver will turn off to protect itself and automatically restart when the voltage returns to the normal range. Fluid flow is lost in this condition. The controller will monitor the manifold pressure, battery voltage, potentiometer settings, push button and error conditions. Two potentiometers are used to set the pump PWM rate. The “Start PSI” dial has a range from .5PSIg (full counterclockwise rotation) to 11PSIg(full clockwise rotation). This is the pressure that the pump will start to operate. The “Full PSI” dial has a range of 6PSIg (full counterclockwise rotation) to 38PSIg (full clockwise rotation). This is the pressure that the pump will be running at full speed. Additionally, the controller will automatically correct for battery voltage variations to give the same flow. Adjust the “Start PSI” value by setting the dial to approx 25% of the vehicles maximum boost. Adjust the full-in value to your maximum boost (up to 38 PSIg of boost). The controller has an “ERROR” LED. This will mimic the operation of the cockpit LED. It will flash out error codes as well as illuminate with varying intensity as a function of flow. There are two modes of pump-driver short circuit protection available. One can detect a short at any time but produces a slight buzzing in the pump. This should not be noticeable under most conditions, but can be turned off if it is objectionable. If the less functional mode is chosen, then a short can only be detected when the pump is running. Pressing and holding the “Test” button while applying power toggles the mode. The change is acknowledged by a fast flashing (6 flashes and then repeats) of the status LED output and the on-board status LED. Once the button is released the controller will continue to function normally. You can also tell what mode has been selected by listening for the buzzing sound in the pump. Repeating this operation will toggle between the two modes. The progressive controller includes a Boost-Safe output (grounded when active) that activates whenever the system is armed and runs out of fluid or an error code is flashing. The green wire on the controller is the 1.7 amp switched ground. This wire can be hooked up to a solenoid that will vent waste gate pressure when activated. Apply 12v to the other side of the solenoid (AEM P/N 30-2400 or equivalent). This output can also be used to trigger a timing retard function in a stand alone ECU or a CDI whenever the system runs out of fluid, thus protecting your engine. A Water/Methanol mix will increase the charge density of your mixture. A significant amount of the power gain available when using a water/methanol injection system is due to the fact that the ignition timing may be increased due to the reduction in the tendency to knock. If the timing is not advanced to take advantage of this benefit then the power gains available will be substantially reduced. As always when tuning ignition advance, use small increments. The injector nozzle should be cleaned periodically. Disassemble the nozzle and clean it with a suitable cleaner until all debris is removed. If excessive contamination is found check the rest of the system for the source. Advanced Engine Management Inc. warrants to the consumer that all AEM High Performance products will be free from defects in material and workmanship for a period of twelve (12) months from date of the original purchase. Products that fail within this 12-month warranty period will be repaired or replaced at AEM’s option, when determined by AEM that the product failed due to defects in material or workmanship. This warranty is limited to the repair or replacement of the AEM part. In no event shall this warranty exceed the original purchase price of the AEM part nor shall AEM be responsible for special, incidental or consequential damages or cost incurred due to the failure of this product. Warranty claims to AEM must be transportation prepaid and accompanied with dated proof of purchase. This warranty applies only to the original purchaser of product and is non-transferable. All implied warranties shall be limited in duration to the said 12-month warranty period. Improper use or installation, accident, abuse, unauthorized repairs or alterations voids this warranty. AEM disclaims any liability for consequential damages due to breach of any written or implied warranty on all products manufactured by AEM. Warranty returns will only be accepted by AEM when accompanied by a valid Return Merchandise Authorization (RMA number. Product must be received by AEM within 30 days of the date the RMA is issued. Please note that before AEM can issue an RMA for any electronic product, it is first necessary for the installer or end user to contact the EMS tech line at 1-800-423-0046 to discuss the problem. Most issues can be resolved over the phone. Under no circumstances should a system be returned or a RMA requested before the above process transpires. AEM will not be responsible for electronic products that are installed incorrectly, installed in a non approved application, misused, or tampered with. Any AEM electronics product can be returned for repair if it is out of the warranty period. There is a minimum charge of $50.00 for inspection and diagnosis of AEM electronic parts. Parts used in the repair of AEM electronic components will be extra. AEM will provide an estimate of repairs and receive written or electronic authorization before repairs are made to the product.